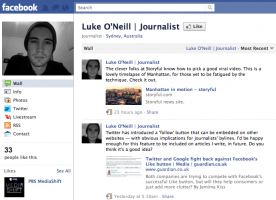 This post was originally published as a note on Luke O’Neill’s Facebook page, May 25, 2011. It is used with permission and has been edited for publication on ModernJournalist.com. Since the beginning of the year, I’ve found a number of stories through Facebook. In fact, I have been able to source more contacts through Facebook than I have through Twitter. I write for the Irish Echo, a small publication in Sydney, Australia. I used Facebook to find sources during the Queensland floods, Cyclone Yasi, the Christchurch earthquake and the Japanese tsunami, earthquake and ensuing Fukushima nuclear scare. We need Irish voices in our stories. The catastrophic events I mention above were not fitting for my newspaper until we were able to find that Irish people were involved. So there is a sort of strange, self-imposed nationality-based restriction to the stories I write. This is where Facebook came in. Organizations are growing more adept in their use of the “like-gate” feature on Facebook. Content can be posted that is only available to those who “like” the page. Adding content “behind the wall” gives the audience an incentive to like your page, which in turn grows your social media audience. But there’s more to it than that. 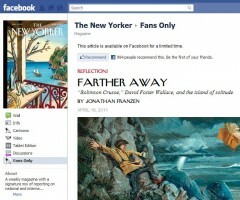 The latest organization to use the feature is New Yorker Magazine, which used the “like-gate” to offer a long-form article by Jonathan Franzen. Other organizations can learn how not to use this feature by studying the New Yorker’s example. Unless a visitor to the page found the piece through the New Yorker’s post, they’re unlikely to know that exclusive content lives behind the wall. And they’re unlikely to have seen New Yorker’s Facebook post, since they don’t yet “like” the page. The tab that leads to the content is labeled “Fans Only.” There’s no mention of exclusive content, no mention of an article and nothing about Franzen, until you click on that tiny little tab. If you’re going to offer exclusive content, make sure anyone who sees the page knows it’s there, and looking for the content isn’t a scavenger hunt. Otherwise, what’s the point? This post was originally published Mar. 25, 2011, for the Asian American Journalists Association. How to do social media right: experiment, screw up and ask for forgiveness. “Be fearless,” said Kevin Sablan, head of the Orange County Register’s web efforts and new-media leader. He gave a presentation Wednesday on social media and innovation, presented by the Asian American Journalists Association of San Diego. 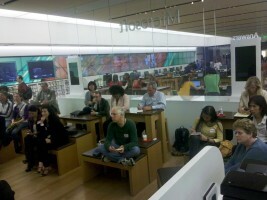 The audience at AAJA-San Diego's program on social media and innovation at the Microsoft Store in San Diego, California, on March 23, 2011. Sablan, AAJA-San Diego’s first speaker of 2011, told the journalists and public relations professionals in attendance that even successful companies like Google have made their share of mistakes. He took us through its product graveyard that houses forgettable products including Google Buzz, its answer to Twitter and Facebook, and Google Wave, which was supposed to make-over Gmail. Both were flops, Sablan said, but showed the importance of trying something new, giving up when things don’t work and not belaboring failure. Sablan, a respected member of the Web journalism community, also talked about tools that help people filter, group and make sense of the noise on Facebook, Twitter and other social-media channels.